Home All About Exabytes Happy Prophet Muhammad’s Birthday! 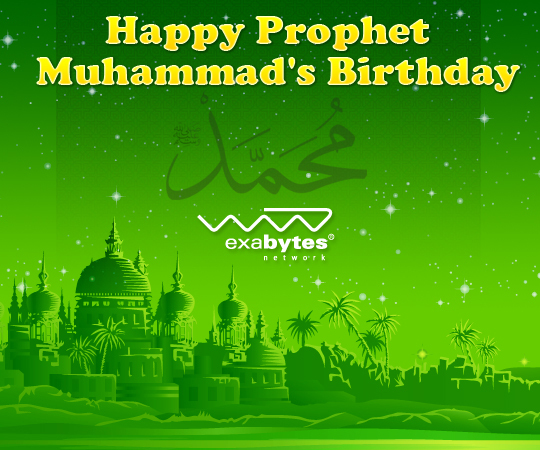 Exabytes wishes all Muslims Happy Prophet Muhammad’s Birthday! January is indeed the month of celebrations. The New Year and Prophet Muhammad’s Birthday both fall in the very first month of 2013! Celebrated by all Muslims in Malaysia and many other countries, Prophet Muhammad’s birthday is commemorated during the month of Rabiulawal, and marked by religious lectures and readings of the Quran. In line with the celebration, our office will be closed on January 24 and resumes operation on January 25. However, in case you encounter any technical issues, don’t fret! Our professional technical staff will still be working 24×7 to assist you via helpdesk day and night. Previous articleGold Is Coming Your Way This Chinese New Year!